Last month, we saw the launch of Vine Kids and today, Google has debuted an all new YouTube Kids app in the U.S., offering a curated selection of videos that are appropriate for young viewers. The free iOS and Android YouTube Kids apps are now available for download in the App Store and Google Play, and initially contain four sections i.e. shows, music, learning, and explore. The app offers parents the ability to control time limits and the ability to lock down the search feature. Today, we’re introducing the YouTube Kids app, the first Google product built from the ground up with little ones in mind. The app makes it safer and easier for children to find videos on topics they want to explore. For years, families have come to YouTube, watching countless hours of videos on all kinds of topics. 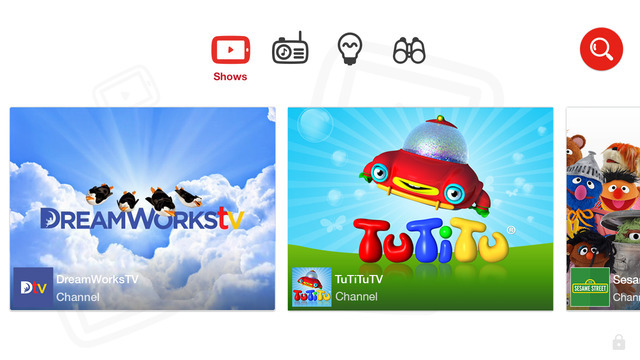 Now, parents can rest a little easier knowing that videos in the YouTube Kids app are narrowed down to content appropriate for kids. Google notes that the new Kids app is the first step towards reimagining YouTube for families, and that the app will continue to get better over time. You can grab it from the U.S. App Store at the following link for free.